There are 13 women in this photo, but only 12 are identified. Ida Leeper, Lida Spirry, Lula Botts, Myra Scott, Estelle Bothwell, Lida Russel, Josie Bottom, Rilla Plumb, Lula Bottom, Mamie Ward, Mamie Halstead, Mary Ruth Bothwell. Estelle Bothwell is fifth from left, as listed. Lula Bottom is fourth from right, as listed. Mary Ruth Bothwell is at far right, as listed. It appears that the unnamed person is among the four women to the right of Estelle Bothwell. 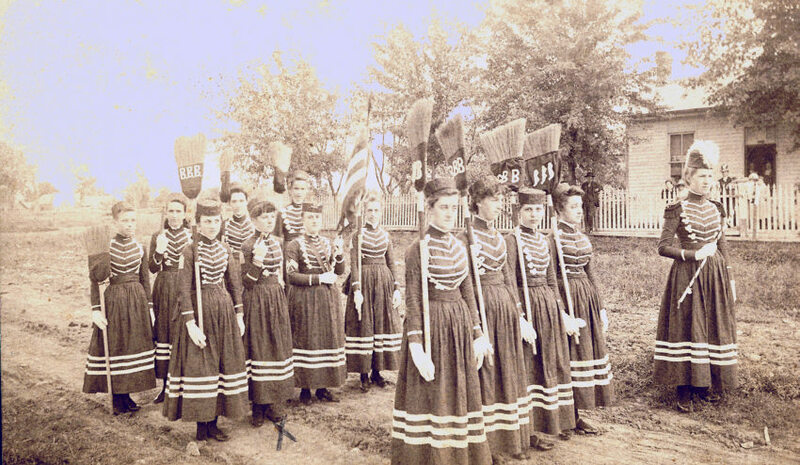 We speculate that this group was affiliated with the Women's Christian Temperance Union as Breckenridge was known for its many bars and saloons at that time. Contributed by Lois Bothwell Stout of Kansas City, Missouri.